By way of the inspired Environmental Education class curriculum created by science teacher, Michelle Hamilton, the students at École K.L.O. Middle School had, by this point in the year, already developed a deep attachment to their sections of the large local-species-garden and were caring as well as learning from it with great attention. What I decided to do was put them on the next level with their garden by having them communicate with it in an applied drama based eco art action I called ‘Planted Communication.’ To use the term created by Robert A. Heinlein’s science fiction novel, Stranger in a Strange Land, I did not want them to just understand the garden they were learning from, I wanted them to ‘grok’ the garden: to understand it so fully as if it lived as part of themselves. In greeting, praising and giving performative gifts of sound and movement to the garden, these students used their knowledge of the plant life to communicate with it on a completely different level than they were used to. This was very well received by them (and the plants) and allowed them to land right into the system of the work they were learning about and from. In our information saturated age, there is no doubt that knowledge and information are invaluable as is clear by the advantages we see the children of today living with over the children of only a couple of generations ago. This is taking into consideration access and availability to an infinite amount of information and opinions on the internet and interconnection through social media between people, ideas and things. However, having all this means nothing in an online database or text book with a lack of the natural ecological system which can teach this hands-on and the context for information which the natural ecological system which it comes from can provide. Without context, there is nothing; anything could be anything else but what one is trying to learn about. Context comes from dialogue between the elements that are being explored and learned about and that just cannot happen holistically out of a text alone. My Planted Communication work with the grade seven Environmental Education classes at École K.L.O. Middle school continued with the work Michelle Hamilton had begun with putting the students I was working with right into the ecological system they were learning about but this time imploring their creative faculties to more holistically experience their ecological system. This allowed them to take their database knowledge and place it into a tangible setting. In Conversation Pieces, Grant H. Kester plainly states, “[t]here is nothing inherent in a given work of art that allows it to play [a given] role; rather, particularly formal arrangements take on meaning only in relationship to specific cultural moments, institutional frameworks, and preceding art works” (90). The formal arrangement here is what I consider to be the original arrangement, nature. We are natural creatures who benefit from natural experience and connection to everything comes out of our original, corporeal, sensory interaction with our natural ecological system. This is where we have come from for millions of years so with our education today, why would we break away from the very context which, from our origin as a species, has defined us. Through my eco-art work with these students, in pairing the scientific knowledge of the grade sevens’ with a creative tool with which they could engage it in the ecological system they were learning about in their classes, a context was forged and thus a full learning was at hand. 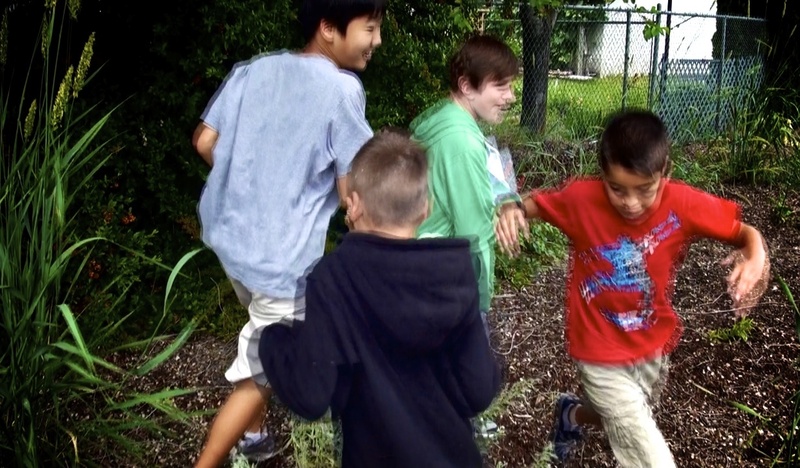 Using movements and sounds as gifts, the students could see the plants they have worked so tirelessly on maintaining in their school grounds as equals. In in her eco-art text book, To Life!, Linda Weintraub defined the eco artist’s purpose as having to “align art’s expressive, narrative and ethical significance with the physical components of experience.” This is not the experience gained from studying a plant from a text book, that is a removed experience. The text book experience is valuable for its knowledge but the very way that information is made available removes the student from what they are studying. Planting these plants to learn that same information brings a full connection to them. Then, creatively engaging the natural ecological system on an equal level creates empathy and allows the student to learn instinctively like they would how to eat from a parent as an infant.